Over the last few weeks I’ve been focused on tidying my stuff rather than making more. I’d come out of the closet and admit to being a very messy hoarder, but would never get in the cupboard in the first place because there’s so much stuff shoved in there. Half my drawers, boxes and cupboards don’t close and the ones that do won’t open. This before and after photo shows the result of yesterday’s tidying. 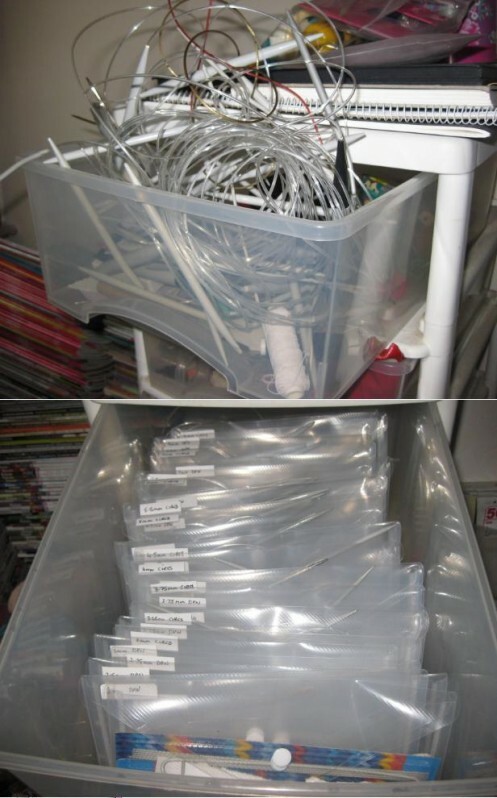 The tangle of knitting needles that has been a total pain for years is now a nicely ordered drawer with lots of little plastic wallets (from WH Smith) all neatly labled with sizes. There are two wallets for each size, one containing circulars and the other for DPNs. The wallets are a little too deep for the orignial drawer so are now in a lower, deeper one which had to be cleared of crayons I’ve been hoarding since primary school in the 80s. I’ve also recently conducted a full clothes hanger audit and learned to fold my clothes sensibly to make more space in the drawers. Watching youtube videos about folding pants can truly change lives. Plus I’ve been through all the accessories I’ve knitted and worked out which ones I wear, made a big pile to rehome (did this on the heatwave weekend – not ideal for rehoming knitwear!) and am now planning to make more of the ones I love in all my favourite colours. Hoarding and crafting are a troublesome pairing. There are so many little cute things to pick up – one little packet of beads or a fat quarter of a pretty fabric doesn’t seem like much but they mount up and pile up. Anyway am hoping if I take action now to get organised, the future won’t involve being burried alive in rubbish. Ooh, that’s a genius system, I might have to steal it. No more ramming evey single circular in the house through a needle gauge only to find that the size you need’s already got half a shawl on it! Also, I found clippy skirt hangers in IKEA for 65p each. I might have to order about a million of them, as I don’t have any drawers to stash my stuff in. It works like a dream! Keep opening the drawer and admiring them all sitting there!